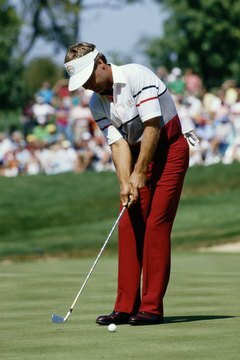 Ben Crenshaw uses his least-lofted club, a 1-iron, in place of his broken putter during the 1987 Ryder Cup. “Butter knife” is the nickname for the 1-iron, the historically significant but now practically extinct club. The club with which players such as Ben Hogan and Jack Nicklaus hit legendary shots in major tournaments has largely been replaced by modern equipment, including hybrids and fairway woods, which are more forgiving clubs. The 1-iron is the longest and least-lofted iron, but it’s rarely manufactured today. The 1-iron first sold by Cleveland in its 588P/588T sets in 1989, for example, measured 39 inches long and featured 17 degrees of loft. Calloway’s 1998 X12 Pro Series included a 1-iron that was 39.5 inches long with 16 degrees of loft. It’s the lack of loft that makes the club difficult for many golfers to hit. In 1996, 17.1 percent of PGA Tour players used a 1-iron, according to ESPN.com. A decade later that number had plummeted to 0.75 percent. Even Joey Sindelar, who was among that 0.75 percent, compared his 1-iron to “a black and white TV.” Golf writer Jason Sobel is among those who cite the development of hybrids at the turn of the 21st century as the beginning of the end for the 1-iron. Sindelar also noted that modern golf balls, which feature reduced spin, make it more difficult to generate distance with less-lofted clubs such as the 1-iron. Ben Hogan struck perhaps the most legendary 1-iron shot in golf history at the 1950 U.S. Open, an approach to the final green that helped him save par, leading to his playoff victory the next day. A 1-iron helped Jack Nicklaus win several major tournaments. His 1-iron approach into the wind landed 6 inches from the 17th hole at the 1972 U.S. Open, leading to a tournament-clinching birdie. Another final-round Nicklaus 1-iron shot traveled 250 feet and rolled within 10 feet of the 15th hole at the 1975 Masters, setting up another key birdie. Costantino Rocca fit a 1-iron shot through some trees and onto the green to help him defeat Tiger Woods in a 1997 Ryder Cup singles match.